It’s become kind of the norm around here for bands to premiere videos on Rolling Stone [Those Darlins, JEFF, Tristen, who are we forgetting?] 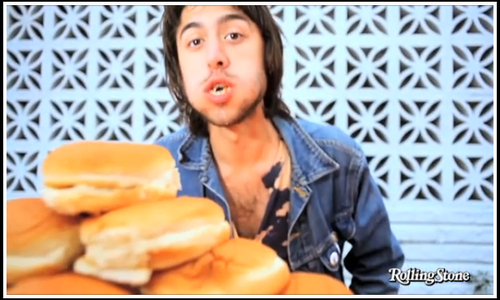 But now it’s PUJOL’s turn with a brand new video for MAYDAY. Of the videos PUJOL’s put out in the last year or so, we think this one is definitely our favorite. PUJOL has been out on the road with Ted Leo for the last while and even got struck with a bite of the flu — but he’s safe and sound back in Nashy now. Plans for the guys are to setup camp again and start working on the next record [the follow-up to the recently released Saddle Creek EP — which you can snag here] We’re always down to get our hands on new Puj-material. Check out the video below. It’s awesome and features some of our good buddies and our favorite city and knives and one of our favorite songs. Cool!